It was common for Victorian ladies (and perhaps gentlemen as well) to announce visits and to acknowledge visits. 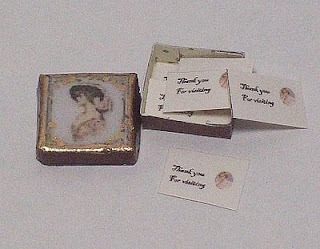 This little box of cards could be carried by a dollhouse lady, or could be put on a piece of dollhouse furniture (perhaps a hall table or in the lady's bedroom) or even in a Lady's Shop offering them for sale. (Box cover styles vary.) If the auction has ended, these can be seen on my website www.violasdolls.com in the "Accessories" section.